Chapter 7 and Chapter 13 bankruptcy can both be effective solutions for individuals and households seeking relief from severe indebtedness. But these two approaches to bankruptcy are very different in many ways – and will offer benefits to different people, as a result. At the end of the day, bankruptcy isn’t a “one size fits all” proposition. It’s important to understand what type may work best for you, based on your unique circumstances. 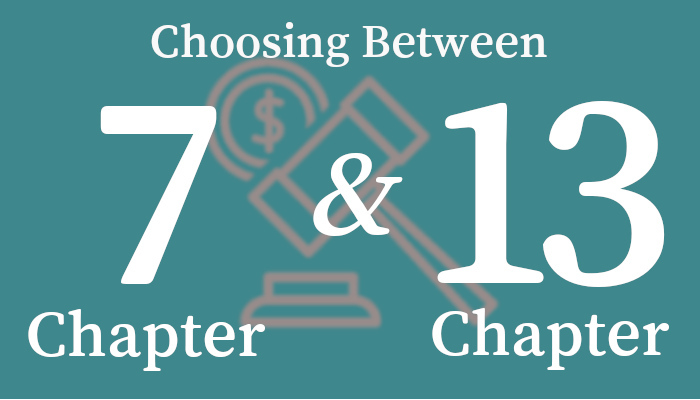 So, what are the differences between Chapter 7 and Chapter 13 – and which type may offer the most benefits to you? Let’s dive into the key differences between these two common types of bankruptcy proceedings. Chapter 7 Bankruptcy is commonly referred to as “liquidation” bankruptcy. Statistically speaking, it is the most common type of bankruptcy among individuals, and many people consider it to be the most convenient form of bankruptcy – because it is a relatively swift process, and can help debtors discharge many different types of debt fairly quickly. Generally speaking, filing for Chapter 7 bankruptcy allows a consumer to discharge many of their unsecured debts, including credit cards, medical bills, some retail store loans, payday loans, and so on. However, it’s very important to remember that certain debts – including taxes, student loans, and child support – cannot be automatically discharged in bankruptcy. It’s also important to remember that not everyone will automatically qualify for Chapter 7 bankruptcy. In order to qualify for Chapter 7, an individual must pass a means test, demonstrating that their income is lower than the state median. It should also be noted that would-be filers must obtain mandatory credit counseling before starting Chapter 7, as well as a financial management course down the line. In order to discharge qualifying debts and pay down others, Chapter 7 filers may need to give up certain property or assets. During Chapter 7, the debtor’s case is assigned to a bankruptcy trustee, who will oversee the surrender and liquidation of non-exempt assets. Any money from the sale or liquidation of these assets is split among creditors. However, in certain cases, Chapter 7 debtors may be able to retain most, if not all, of their personal property, including their home and vehicle. It all comes down to the debtor’s personal circumstances. As for the timeline? Generally, most Chapter 7 bankruptcy cases take a few months to complete. After filing for Chapter 7, the bankruptcy will remain on the consumer’s credit record for up to ten years. Who Does Chapter 7 Really Work For? Of course, it’s important to remember that everyone’s situation will be different. Before starting the Chapter 7 bankruptcy process, it may help to discuss all of your options with an experienced professional, such as an attorney. It’s important to consider whether bankruptcy will truly be the right fit for you; in some cases, alternative solutions, including other types of bankruptcy proceedings, may be available. Chapter 13 is another common form of bankruptcy for individual consumers and households. Also known as “reorganization” bankruptcy, Chapter 13 is a way for debtors to systematically restructure their debts by setting up a repayment plan with their creditors, to be followed for a number of years. This process then often culminates in remaining balances for certain relevant debts being discharged. In Chapter 13, consumers use a repayment plan to pay back their creditors, either in part or in full, generally over the span of several years. The exact specifics of the repayment plan – including the time frame and the amount paid back to creditors – will vary from case to case, depending on the person’s income and expenses, the types of debt they hold, and so on. Typically, when the debtor’s structured payment plan is successfully executed, the court then issues a discharge order, allowing for most remaining unsecured debts to be discharged. As in Chapter 7, there are certain exceptions (such as student loans and child support obligations) that cannot be discharged via the bankruptcy process. One of the advantages of Chapter 13 is that filers usually get to retain all of their property, including non-exempt assets. Unlike Chapter 7, Chapter 13 also gives filers the chance to catch up on past mortgage payments, and strip certain liens from their property. In Chapter 13, there is not an income requirement, but a person’s secured and unsecured debts must fall below a certain limit in order to qualify. As in Chapter 7, non-corporate debtors are required to take credit counseling course through an approved agency, as well as a financial management course after filing. Most commonly, repayment plans in Chapter 13 span three to five years. The bankruptcy may remain on a consumer’s credit report for up to ten years from filing, though many creditors only choose to report Chapter 13 for seven years. Who Does Chapter 13 Really Work For? Broadly speaking, Chapter 13 is intended for debtors who are still making a regular income, who are able to pay back at least some of their most significant debts in line with a structured repayment plan. Chapter 13 is sometimes called “wage earner’s” bankruptcy, for just this reason. Chapter 13 is often a viable option for people who need debt relief, but who do not qualify for Chapter 7 based on their income or means testing. It is also often a more useful solution for debtors whose types of debts don’t qualify for automatic discharge under Chapter 7, or who want to retain their non-exempt assets. Many people who are facing foreclosure or repossession of a car or a house can also often benefit from Chapter 13, which allows filers to strip away liens on real property and reduce the principal loan balance on secured debts, if certain requirements are met. Again, it’s important to bear in mind that, no matter your situation, you do have options. It’s often key to talk to an experienced professional, such as an experienced bankruptcy attorney, before pursuing Chapter 13 bankruptcy, which can be a long and time-intensive process for debtors. Ultimately, no two people are going to be exactly alike. And so, while the general course of bankruptcy is often set in stone when it comes to both Chapter 7 and Chapter 13, the specifics are going to vary wildly from case to case. Your approach can’t be cookie cutter, and, for many people, it may be incredibly helpful to meet with a bankruptcy professional, in order to determine what course of action will truly help you achieve the results you’d like to reach, in the timespan that works for you. When it comes to getting you the debt relief you deserve, there are any number of crucial factors that need to be taken into account – from your income, to your allowable expenses, to the amount of secured vs. unsecured debts you have. It’s important to also understand the mathematical formulas used for means testing, and so much more. Bottom line? It’s a lot to tackle alone – but the attorneys and staff of the Gunderson Law Firm would be happy to help. If you have any questions or are looking for guidance about Chapter 7 or Chapter 13, the Gunderson Law Firm can help can get you actual, straightforward answers for your unique situation – no need to search for all the variables and hope you don’t miss any key detail. At the Gunderson Law Firm, our experienced bankruptcy team will take all steps possible to protect you and your assets immediately, and throughout the bankruptcy process. Down the line, we can also counsel you on realistic ways to avoid such serious debt issues in the future. Whether you are a business owner, a wage earner, retired, or otherwise, we can address your specific situation with strategic plans to help put severe indebtedness behind you so you can enjoy life again. Don’t hesitate to drop us a line with any questions, or to set up your free initial consultation.